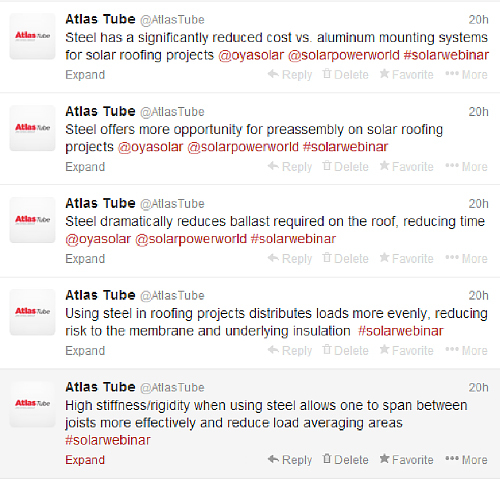 Over 40 people tuned in yesterday to attend The Benefits of Steel Tube in Solar Racking Structures webinar, held by Solar Power World and sponsored by Wheatland Tube. 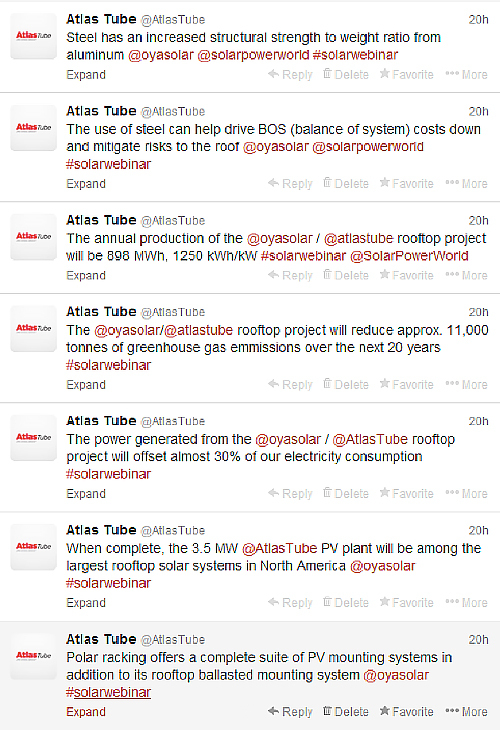 OYA Solar, a premiere developer of Solar PV systems in Ontario, led the webinar discussing the recent developments from Phase 1 of its solar roofing project with Atlas Tube. The OYA/Atlas Tube roofing project is unique in that it utilized 100% steel tube for the racking structure. When complete, this 3.5 MW project will be the largest of its kind in Canada, and one of the top 5 largest in North America. With an annual power output of almost 900,000 kWh, this installation will supply enough electricity to power 60 homes for a whole year. The webinar also provided a cost benefit analysis and a comprehensive comparative analysis of using steel tube for rooftop racking structures, versus more traditional rooftop options such as aluminum. There were excellent questions from participants throughout, namely surrounding the galvanization process. If you attended the presentation, or have any questions regarding this solar project, let us know! Leave a comment below.